Senseo coffee pods reviews – Is this the perfect coffee pod? The frothy beverage that results from these Senseo coffee pods is reminiscent of European coffee shops. One important thing to remember when shopping for Senseo coffee pods is this: they are not compatible with Keurig 2.0 coffee brewers. First off, this selection offers a total of 108 bags split up into a pack of six (18-count) 4.41-ounce bags. Secondly, since they are the specially-designed Senseo pods you know they will work perfectly with your Senseo coffee maker. And thirdly, this is the dark roast variety which is very popular. The coffee contains a hint of almond as well as dark chocolate which makes this a tasty and flavorful brew. 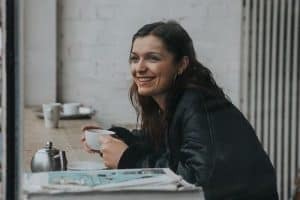 Various online reviews of the Douwe Egberts Dark Roast coffee agree with our own experiences and are positive with references pointing to the taste of the coffee as standing out more than most anything else. One reviewer compares this dark roast to other well-known brands stating this one “delivers a quick, convenient coffee that is full bodied, rich and devoid of a burnt flavor.” It doesn’t get much better than that if you base your internet shopping on reviews found online. The frothy beverage that results from these coffee pods is reminiscent of European coffee shops. For some reviewers these Senseo pods are great for reliving those moments while relaxing and enjoying a hot cup of this dark roast blend of coffee. Others look to the more practical reasoning that to purchase the same kind of latte in a coffee shop is in the five dollar range “when I can make my own cup of foamy happiness in less than a minute and for so much less.” Did we mention these Senseo coffee pods also brew quickly? Some customers who have purchased this product have also suggested a mix and match approach combining the dark roast with a medium roast which apparently produces a “nice, fragrant cup that packs a jolt.” Other reviewers rave about the pod design pointing out that they have been able to get two cups of coffee from a single pod and in less than a minute. Many people get pods and cheap k-cups confused, however these are pods that are used in a Senseo coffee maker. They do not work with the Keurig 2.0 machines, but are part of the current wave of individually packaged coffee mini containers. They insert into a machine that produces great tasting coffee in under a minute with no grinds to clean up, and just a pod that can be tossed in the garbage. The Douwe Egberts Dark Roast variety is a popular choice of many who have compared the hot, smooth cup of coffee it produces to many name brand coffee shops claiming it is a comparable (and in some cases, considered better) cup of coffee. Price is also a factor where these pods cost virtually pennies versus a few dollars for the same cup in a coffee shop. 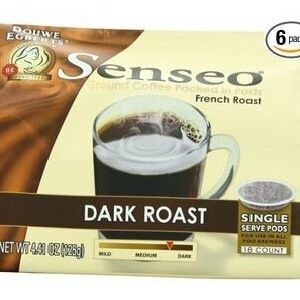 If you own a Senseo Coffee Pods machine you will want to order this blend of dark roast coffee pod for its superior taste and flavor. But not only does Douwe Egberts give you great coffee, they ensure that you can purchase your coffee of choice in bulk, meaning you save even more money on each cup. This means you will be less likely to be caught short with no coffee pods in the cupboard; as no one likes to wake up in the morning to discover they are going to miss out on their morning coffee. Click here for more information on the Douwe Egberts senseo coffee pods.